With all of the volatility of late, why not take a look at daily and intraday moves over a long period for the DJIA . 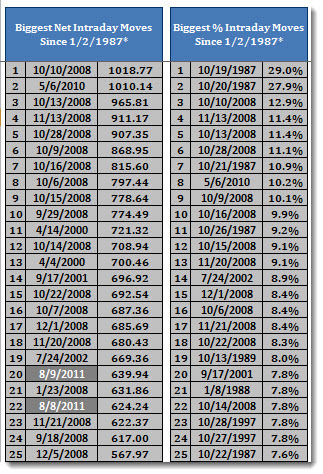 By far, 2008 has had some of the biggest daily moves, only second to the 1930’s. 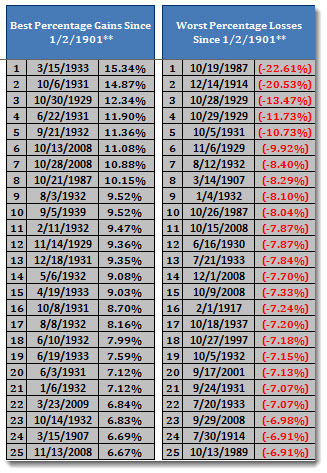 From a historical perspective, the recent action does not make a big showing in the Top 25 on a percentage basis. Next, the best and worst daily net point gains. Notice that there are several during 2011. Finally, the best and worst days on a percentage basis. The 1930’s takes the award. 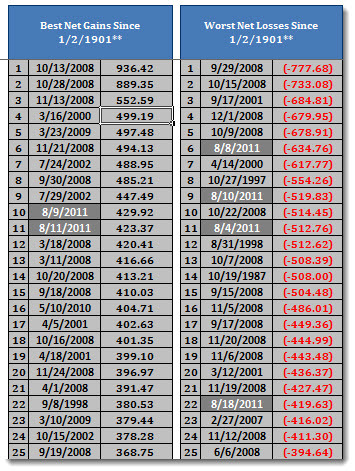 **Earliest available date for daily gains and losses after 1/1/1901 is 1/2/1901 or the next trading day.